It’s a great shame that architect Charles Holden (1875-1960) never designed a church or cathedral. The Modernist architect would have made a very good job of it. He’s now most famous for his London Underground stations which formed a key part of the network’s corporate identity in the 1920s to 1940s. However, he also designed chapels at Midhurst (West Sussex, UK) and Maidstone (Kent, UK). Austere and clean, they are still fairly conventional. Yet his work at the two stations in this week’s entry show that had he been given the chance to let rip, he could have designed a quite brilliant Modernist cathedral. Modernism is a surprisingly good fit with church architecture. While the Church of England built its last great Gothic cathedral as late as 1978 (admittedly it had been under construction for 74 years) in Liverpool¹, it also opened a spectacular Modernist cathedral in Coventry, in 1962. A replacement for the war-damaged original, the cathedral was initially controversial in discarding conventional cathedral construction. In form, it is radically Modernist, but in character, it is utterly peaceful and calming. It is a building to win over those sceptical of the appeal of Modernism. Cathedrals and churches don’t, on the face of it, have a lot to do with transport, except for the fact that large railway termini were/are often referred to as the cathedrals of the Industrial Age. When you take a look at the soaring train shed of London’s St Pancras station, or pictures of the lost Penn Station in New York, USA, you get the point. But it’s train sheds (shelters that overspan tracks at a railway station) that bring us back to Charles Holden, and the first of this week’s transport beauties, his station at Cockfosters on London Underground’s Piccadilly Line. Holden had worked for London Underground managing director / London Transport chief executive Frank Pick since the 1920s, remodelling existing stations and building new ones as the Underground expanded. Holden’s Art Deco/Modernist station designs (the argument over which they were isn’t worth getting into for now) formed part of Pick’s vision of an Underground corporate identity built on excellence in design. It extended beyond stations to maps, trains and publicity. Together, Pick, Holden and other talented designers built a corporate identity which essentially still defines the Underground (not to mention overshadowing the earlier attempts of Leslie Green to do the same thing). 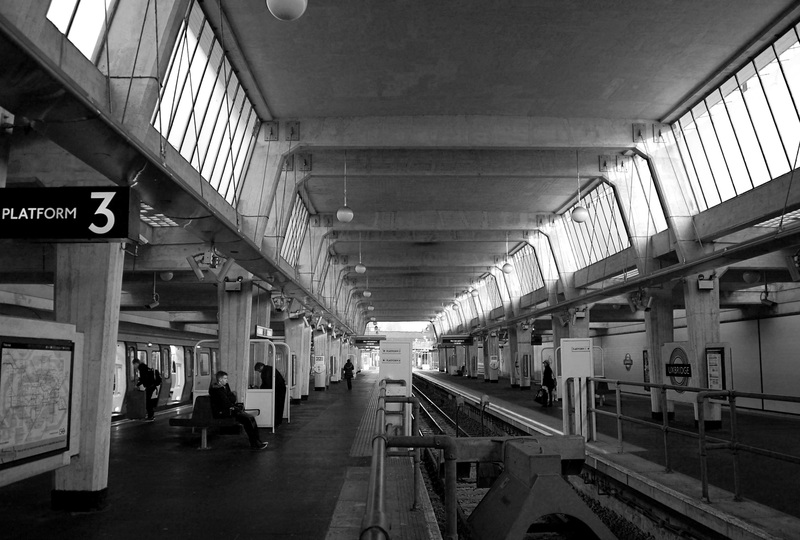 Holden’s modernist stations have been characterised as “brick boxes with lids”, and the design arguably reached its zenith as a collection on the Piccadilly Line’s northern extension from Finsbury Park. Some of the brick boxes were square (like Oakwood) while some were cylindrical (like Arnos Grove) or even octagonal (Bounds Green). The bright and airy ticket halls with their huge glazed panels and lofty ceilings spoke of efficiency, modernity, and welcome. When it came to the terminus at Cockfosters, however, Holden broke away from his brick box model. 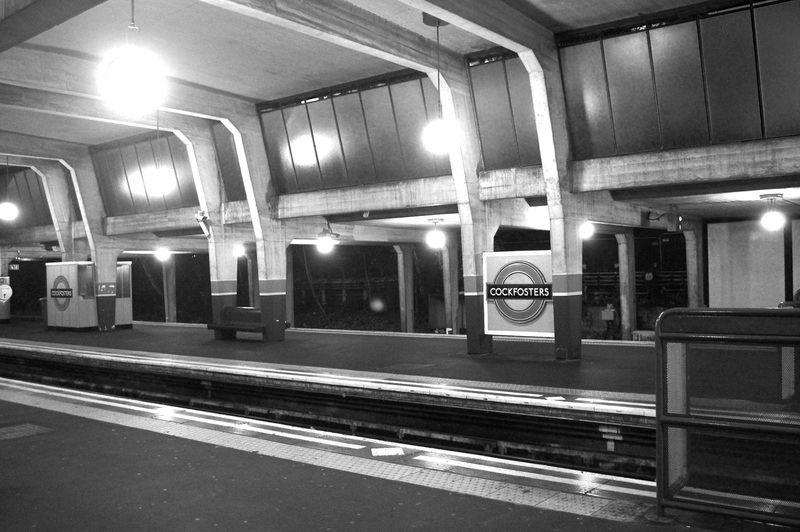 Cockfosters station opened in 1933. As a terminus on a surface site, the station was granted a grand train shed design of the classic railway variety. With only three tracks and four platforms, it just happened to be a classic train shed solution on a somewhat smaller scale than many. 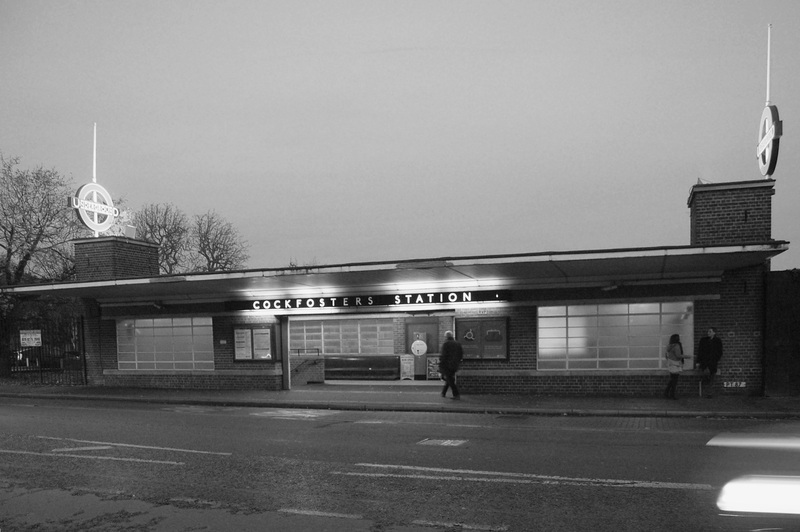 Though the concept harks back to the great Victorian railway termini, the design of Cockfosters is defiantly Modernist. Instead of a steel roof on brick or iron pillars, Cockfosters is a symphony in pale concrete. The most extraordinary thing is that this small scale cathedral of the Underground railway feels just like, well, a Modernist concrete cathedral. The central section of the trainshed is a double height nave with clerestory windows at the top, flanked by two single storey aisles – just like a church. The pillars of a conventional church are replaced by angular portal frames (structures which combine pillars and rafters into a single unit) repeating in pairs all the way down the train shed. The ‘aisles’ at the outer edge of the train shed are open at the sides, with the portal frame legs breaking up the space, cloister-like. If only Holden had built an actual cathedral; it really would have been quite something. As it is, Cockfosters’ trainshed is a remarkable space and like the miniature cathedral it resembles, it is one of the most tranquil Underground stations on the network. It feels wrong to make too much noise, or too much fuss here. Lovely glass globes (if not the originals, then identical copies) hang from the ceiling on thin wires, leaving them apparently almost hovering over the platforms. While the double height section of the trainshed is lit during the day by clerestory windows, the single height canopies on each side are illuminated by glass block skylights – very Modernist and stylish. The ticket hall is an irregular pentagonal extension of the trainshed, the portal frames fanning out from the centre and segmenting the ceiling and walls, which nestle up to the angle of the local roads. English Heritage describe it as “prow” shaped, though in truth that seems a bit of a stretch. Although Cockfosters is built of concrete, which has largely been left bare, the lower parts of the walls and portal frames sport a rather natty paint scheme in turqouise, yellow and green. In the narrow bays between the portal frames, Underground roundels and curvaceous wooden benches break up the space. Curiously, unlike most railway termini, the entrance/exit to the ticket hall is not in line with the trainshed. Instead, thanks to the arrangement of the local roads, the exit is off to one side. It leads to two small surface buildings, made of brick, in a simple but pleasing style. If they lack the street presence of Holden’s larger brick boxes with lids, that is because they were planned to sit at the bottom of never-realised building developments above them. It’s a problem that continues to plague the Underground, with 1999’s Southwark tube station (for instance) also designed to have an office development over its eastern entrance, which hasn’t been built yet either. 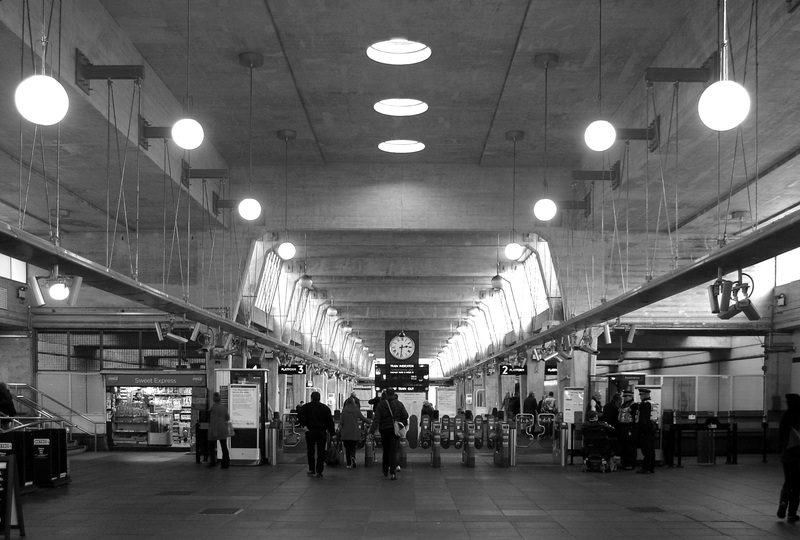 Anyway, Cockfosters’ brilliance is not on-street ostentation, it’s the austere mathematical regularity of its bold ticket hall and trainshed. Its proportions are quite simply mesmerising. Admittedly, it’s not to everyone’s taste. 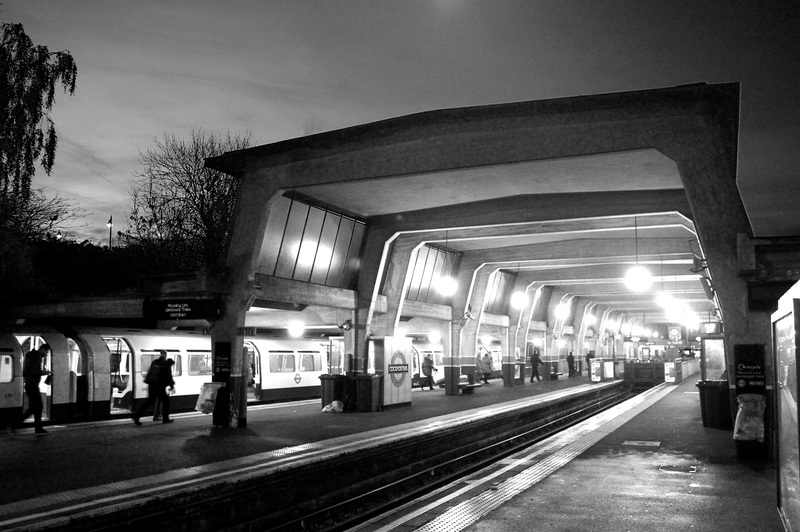 In his otherwise brilliant London Underground by Design, author Mark Ovenden says that Cockfosters is “perhaps less aesthetically pleasing than some of the stations to the south of it,”² a statement with which some would take considerable issue. Cockfosters is so brilliant, it must have seemed to Holden a shame to waste it. A few years later, he managed to build it more-or-less all over again, 40-odd miles away at the other end of the Piccadilly Line, in Uxbridge. There, Pick faced a dilemma in the late 1930s. The terminus needed resiting and reconstructing. Holden’s firm, Adams Holden & Pearson subcontracted the work to Leonard Holcombe Bucknell, who produced a design which Pick liked not one jot. It was all wrong and far too expensive. Holden ‘got’ Pick (and vice versa) and it must have been difficult for Pick to accept designs which didn’t fit into his vision for the Underground, from others in the firm. (He did at times accept designs from other architects which were more like Holden’s typical style, usually with Holden having had some involvement at the initial stages.) Pick insisted that Holden revise the design for Uxbridge³. Either Cockfosters was too good to waste on a single use, or Holden (busy with his designs for the Senate House at the University of London) wanted to make the point that he couldn’t just be at Pick’s perpetual beck and call. What Holden delivered was essentially Cockfosters transplanted to Uxbridge; a second bite of the cherry. 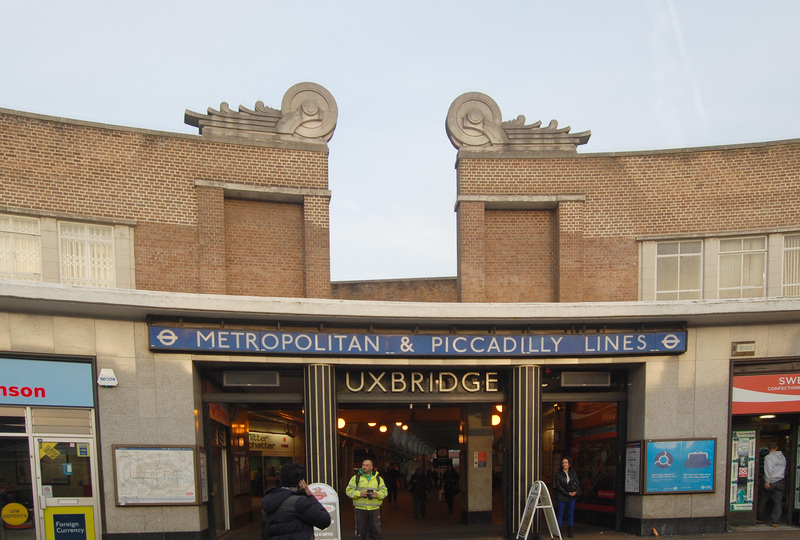 Despite this, the design of Uxbridge is still credited to Holden and Bucknell. Opening in 1938, the re-used design of the trainshed was all but identical: three tracks, four platforms, concrete portal frames and roof, clerestory windows, glass block skylights, the lot. But there were a few key differences, which prove the old adage that lightning never strikes twice. Cockfosters is served solely by the diminutive tube trains of the Piccadilly Line. It’s a small thing (literally) but it completely informs the proportions of the ticket hall and trainshed. The Metropolitan Line trains which share Uxbridge with the Piccadilly Line’s tube trains, however, are full size trains of near identical dimensions to those on mainline British railways. As a result, the trainshed and ticket office at Uxbridge are taller, and the proportions are just not quite right. It’s almost impossible to define exactly what’s wrong with Uxbridge, but it completely fails to recapture the serenity of Cockfosters. The pitch of the concrete roof and portal frames is ever so slightly flatter. At either side of the trainshed, there are full height walls (the station is in a cutting) rather than largely open cloisters at Cockfosters, making Uxbridge somehow slightly claustrophobic despite the higher ceiling. Despite some marvellous circular skylights, the ticket hall is also slightly disappointing. 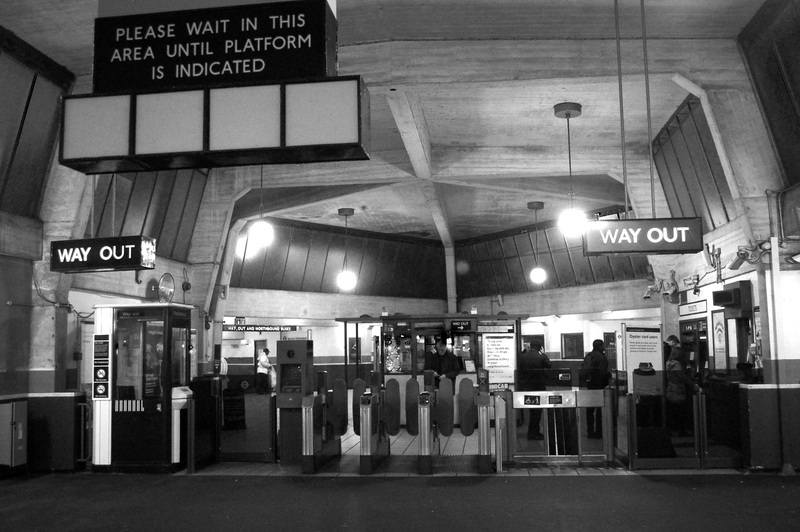 It dispenses with the pentagonal form of Cockfosters’ ticket hall in favour of a much more conventionally shaped space. The entrance/exit is in line with the train shed, and outside, the entrance is rather more grand. Two curved wings, mounted by winged wheel sculptures, frame the entrance and make a far greater on-street statement than Cockfosters does. But this ornamentation seems at odds with the pure sculptural forms for which the ticket hall and trainshed inside strive. It ought to be just as good as Cockfosters, given that it is such a close copy, but somehow everything that works so brilliantly at Cockfosters doesn’t quite come off at Uxbridge. London Underground has hardly helped matters in recent years either, installing lighting and PA units which run the length of the platforms. These are suspended by wires from the portal frames, which adds fuss and breaks up the space in a most unwelcome manner. 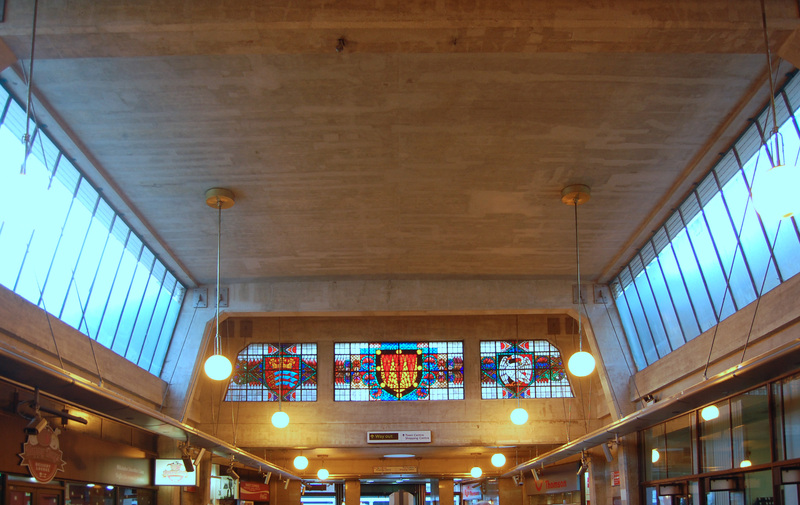 One of Uxbridge’s other differences from Cockfosters is the inclusion of several stained glass windows high up in the ticket hall. Granted, they are rather grand, but the old-fashioned designs sit uncomfortably with the Modernism of the rest of the ticket hall and trainshed. They feature local coats of arms, in an unhappy juxtaposition of the modern and the mediaeval. Uxbridge is still leagues ahead of most transport design, but for the perfect Modernist concrete trainshed, it’s Cockfosters every time. All photos by me this week. 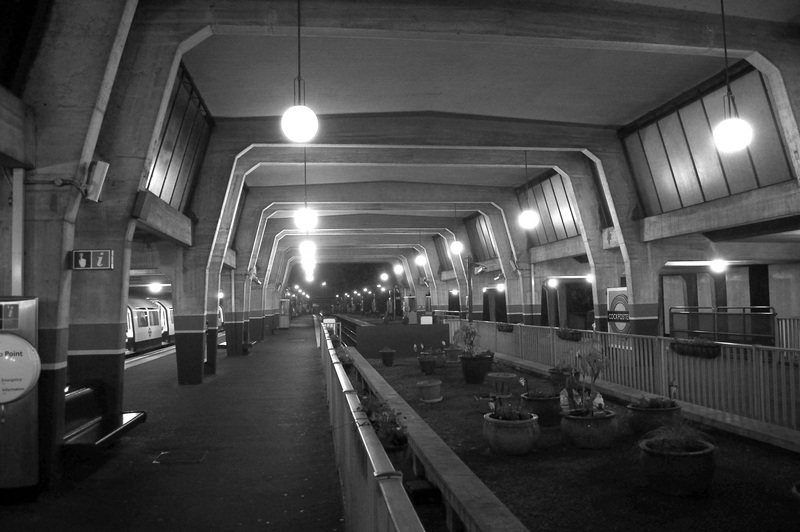 Something about the design of Cockfosters and Uxbridge seems to suit black and white reproduction. Original versions, in colour, can be found here for Cockfosters, and here for Uxbridge, with some additional photos as well.